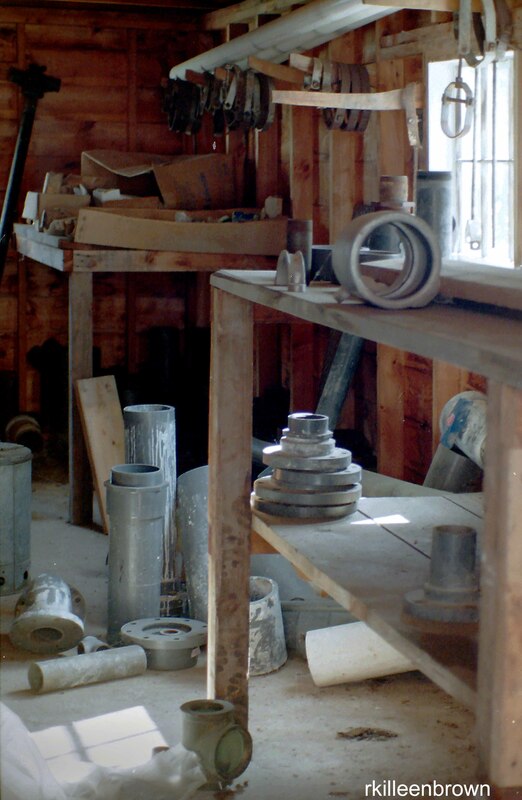 I love this old workshop with all the metal components so perfectly arrayed. It was a building on what was once a dairy farm, though no dairy barn was there anymore. The house was empty, the garages and sheds full of “stuff that might be needed later” I had thought the place would be torn down for the land it sat on to be developed, but surprisingly the house and most outbuildings remain. The house is rented and the rest of the property is used by a landscaping firm for their equipment. To me a much more satisfactory use of the old farm than more cookie cutter homes, or one large “look at me” house. I love to poke around old places and see the structures, the debris and feel the history. As this workweek starts I am trying to get in the mindset of work, to get a bunch done at the studio before the “in office” hours start tomorrow. But as I only have 2 open hours today I am fighting the ticking of the clock, and I already know how that ends! But I will get done what i can and maybe this afternoon get out with my camera for a bit. Who knows what the next few hours will bring! This entry was posted in Photographic Musings and tagged old buildings, work by rkb665. Bookmark the permalink.